Gmails accounts have all disappeared under Google Chrome Version 71.0.3578.80 (Official Build) (64 bit) Ubuntu 18.04 LTS and Windows 10. I dont understand what's happening it has always worked well until today. Did you perhaps disable (or play with) the Auto Sign-in setting of Chrome? Do you use one Google account for Synchronization? Is the password of that account (not) saved in Chrome? When I turned of Auto Sign-in accounts.google.com landed in the Never Saved list. And I suspect because my main Sync account password wasn't saved in Chrome all my Google accounts disappeared from Neo (they all got logged out). Everything is checked and the passwords are saved. Thank you for your interest and your answers. Windows 10, HP Envy Laptop. But still no email accounts under the toolbar icon! Auto Sign-in or Saving passwords have no relation with X-notifier Neo. 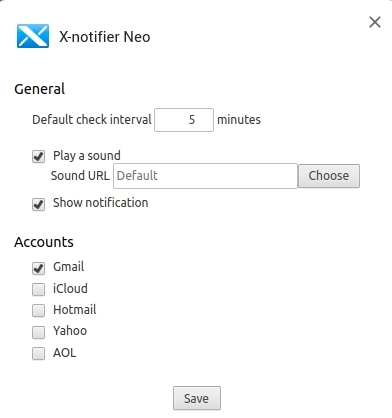 Once you access Gmail, X-notifier Neo will detect it. I have the same problem as ColieBud. 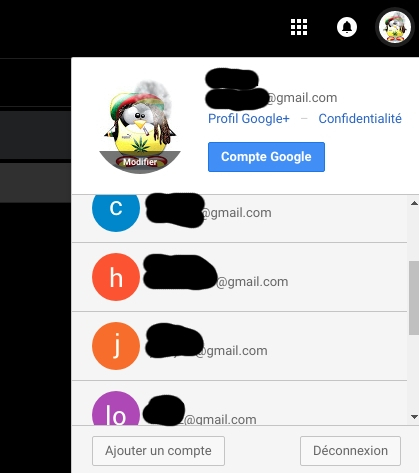 I have access to all my Gmail accounts. I am connected to all accounts but none is detected by X-Neo. I do not understand why it worked very well until 2 days ago. I admit that I am completely lost. I found where my problem came from. I do not know why she was gone. May be due to a cleaning of Cookies. ColieBud, how did you "authorize" the address? I am using chrone browser, windows 10. UPDATE: Now I can see the various addresses in the drop down menu, AND I can click on each one individually and go to that address, (yay!) HOWEVER, it STILL does not notofy or show new emails in the drop down menue like before. Did you find where to put the address? In Chrome = Settings / Advanced Settings / Content Settings / Cookies and at the bottom of the page "Authorize" "Add". "Have you tried emptying the cache?